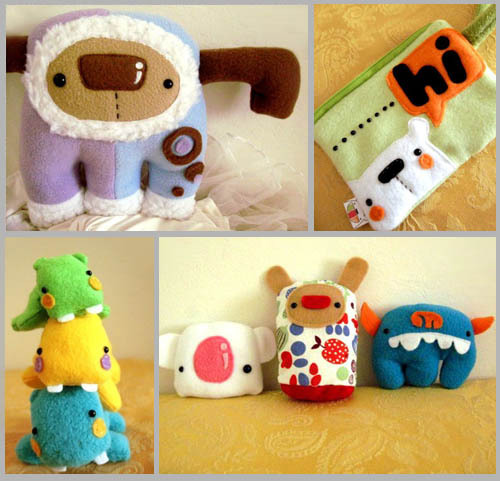 I found these amazing handmade plush creatures from Ninon while browsing through flickr the other evening. I love the uniqueness of all of these little creatures and can imagine making up stories for each one of them. I really wish I had the skill set to sew imaginary beings with as much personality as these. 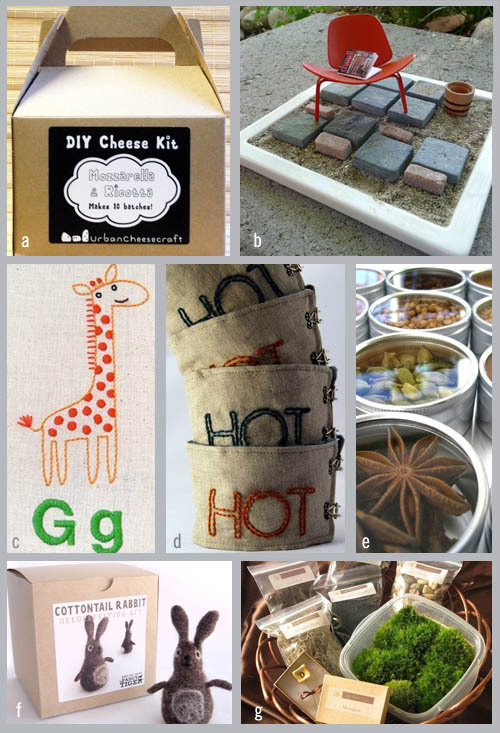 If you are dying to have one of your own check out her shop. Oh Abigail Brown, why must you make me swoon so often over all your fantastic pieces. 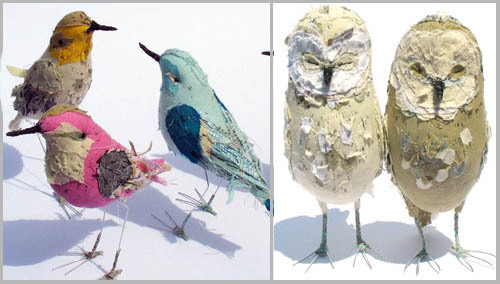 Today in particular I am pining over your small fabric birds. When I was younger my parents had a wooden swan that i would pet everyday, hoping that one day it would come alive. I know I was a strange child. But the point of this story is, I really do think these little fabric birds might come to life if you pet them often enough. Matt and I have quite a few plants that are doing quite well this year, and quite a few that didn’t make it. The basil we planted is quite a trooper and keeps bouncing back even when it looks like it’s on it’s last leg, And our strawberry plants are currently yielding a crop of 3 strawberries so we are pretty excited about that. I just don’t think either one of us has a green thumb, we are however really good at taking care of our corgi, so thats a gold star in my book. I’m sure you know some friends like us, the ones who love having plants but just can’t seem to keep them going for a month or more. Well Plushsoup has the perfect solution. 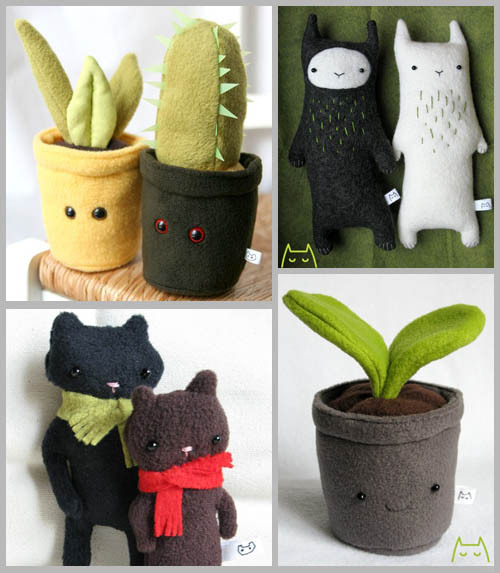 Check out these amazing plush plants. You don’t have to water them or even keep them in direct sunlight (or partial shade depending on the variety). With these little faces how can you keep from smiling with one of these guys on your window sill. You won’t even have to pay the neighbors kid to come over and water it while you are on vacation this summer. 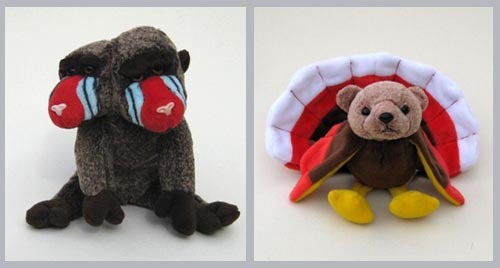 Plushsoup also has some other nifty little critters available for adoption. I really think this would make the perfect gift for that favorite somone headed off to college for the first time in the fall. 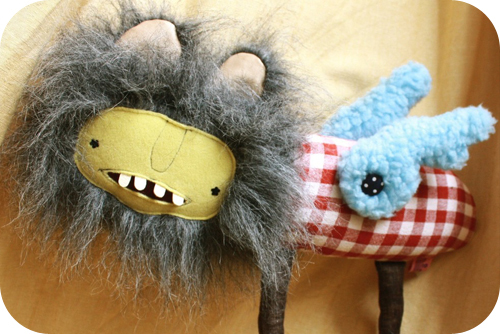 I just thought these mutant stuffed animals from Lucy Roberts were a riot, and I had to share them with you. These little critters might even go unnoticed in a pile of toys, ala E.T. Artistic statements or playthings for the imaginative child? Either way I can’t wait to see what creature she concocts next. Or is that sushi for animal lovers? EIther way I had this huge craving for fish while on the L train last night. So we stopped and got some spicy tuna rolls from my favorite sushi place on Graham Ave. For those of you who love sushi as much as I do, maybe its time to have a little bit of sushi in your life every day! Check out these amazing plush sushi rolls from Cornstarch. California rolls, Hosos rolls, and even wasabi and ginger are there for you to cuddle up with whenever you have that sushi craving but already ordered mexican. If you are looking for that unique valentines day gift for your favorite sushi sharer, make sure to check out the Tekka Maki roll with its heart shaped filling. 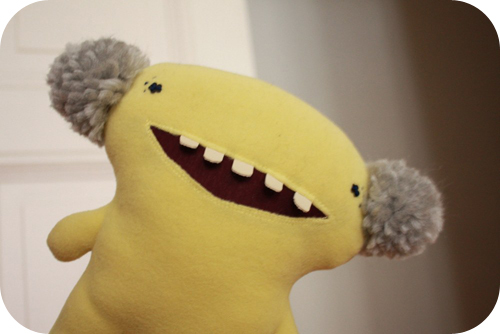 I’m a big fan of handmade soft toys, and todays find made me almost fall out of my chair. Terry the Tortoise, from Hel Made, is self proclaimed as being the fastest tortoise in the UK. I do wonder how he would do against my one eyed walrus in his home turf. Its a battle of the sea creatures! Terry definitely will win in the uniqueness category, his shell is intricately made with layers of hexagons that demand attention. But my walrus might win a sympathy vote, due to his eye-loss from doing battle with the great corgi Einstein.